Posted on February 16, 2013, in Babies, Blogging, Clean Eating, Community-Supported Agriculture (CSA), Contests, Desert Gardening, Giveaways, Health, Herder-gatherer Paleo Diet, Low-carb, Medical Stuff, Midwives, Organic Gardening, Pregnancy, Scary stuff. Bookmark the permalink. 3 Comments. I gained around 10lbs this last pregnancy. I didn’t diet or anything, I just had a serious sugar aversion for most of it, which was really nice, and I just wasn’t that hungry. I wish I could say the sugar aversion stuck around, but no such luck! I’m going to have to watch myself that I don’t gain weight breastfeeding like I did last time… But what I was going to say was that I only gained 10lbs, and the baby was 9lb7oz, so I don’t feel badly about not gaining much weight either! And those veggies look delicious! glad to hear you got the all-clear for your heart condition in this pregnancy! Organic veggies yesterday and today and we all are really enjoying those carrots. Sliced thick, 2 T of olive oil in cast iron skillet, diced onions, sprinkle of garlic and ginger! Heavenly Gingery Carrots and so SWEET. Ed had seconds! Put turnips, red potatoes, lots of spices, one can of rinsed Black Beans, one can Costco chunk chicken in crockpot and the smell was heavenly. Nicknamed this: Awesomely Organic Soup!!!! : ) (VERYsmall bowl of leftovers for Sunday snack!) 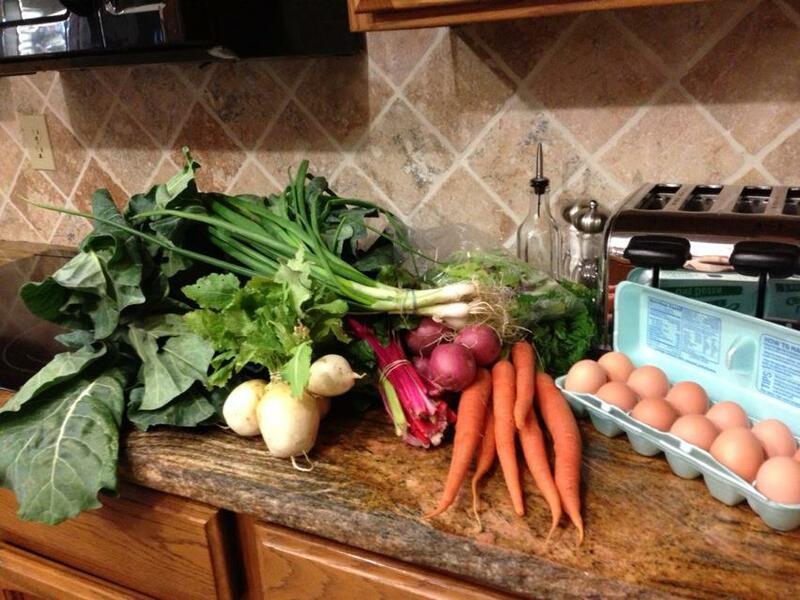 Ed has now decided that he wants to JOIN the Organic “Club:” Soo…we are ready for Karen’s next Organic delivery. You still have my phone number???? ?